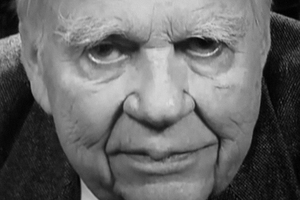 Longtime CBS contributor Andy Rooney died yesterday at age 92. While most will think of him as the cantankerous commentator sitting at his cluttered desk, delivering critiques of modern contrivances, I had a bit of a crush on him. “Whaaat?,” you might ask, envisioning Rooney’s epically overgrown eyebrows and habitually hangdog expressions. But this was more than 20 years ago, when I was in high school, and his books I was reading then were published in the 1980s. Sure, he was already a senior citizen. But on the book covers he appeared rakish and charmingly disheveled. (Or maybe his quick wit and sharp observations just softened my teenage heart!). I didn’t think of him as a curmudgeon but as a world adventurer whose experiences influenced his thoughts on topics ranging from current affairs to what he ate in the morning. Though best known for his “60 Minutes” TV commentaries, Rooney also was a syndicated columnist and published several books of essays. He served in the Army during World War II, writing for The Stars and Stripes and working with journalists Ernie Pyle and Walter Cronkite. As a high school student, I dreamed of working at such a job — having a regular space to fill with my own thoughts and observations. I wrote a column for my high school newspaper, then my college newspapers. Later, when I became a journalist myself, I made career decisions based on whether I’d be able to — or have hope of having — a coveted square of space to host my point of view. With his characteristic whining delivery, Rooney’s “60 Minutes” bits were easy to lampoon. But I looked forward to the segments to see what topic he would choose and what he would say about it. He knew what he thought about subjects as wide as war and as small as the ingredients printed on a product box. Whether on air or in writing, Rooney conserved words, but always used them effectively. His pieces demonstrated biting wit, sometimes scorching sarcasm and microscopically keen observations. It is those observations that most influenced me as a writer and as a person. He introduced me to a lens that paid close — very close — attention to the details of life, the tools and products we interact with daily, the sights, sounds and flavors we absorb, the trends and personal quirks we encounter. Small things tell stories, whether as they stand alone or when taken as a collection. Magnifying those small details tells us something about others, ourselves and our shared world. Though often annoyed or exasperated in his rants, Rooney also wrote memorably of the small joys of life: the solace of a comfortable chair, the value of silence, the pleasures of a nap, the smell of wood or a freshly pressed shirt. Reading Rooney was one of those small pleasures, amplified manifold. Mr. Rooney, in light of my high school crush, I say to you: U R 2 Good 2 Be 4 Gotten. This is a blog about waiting, not waiting, and things I think about between or doing the things that occupy me. The title is a take on “Waiting for Godot,” the absurdist play by Samuel Beckett, in which two men wait for someone named Godot to arrive. He never comes, but while they wait, they talk, eat, argue, play games and otherwise entertain themselves. The play’s been analyzed to be an examination of everything from religion to communism — I’ll make no such broad assertions. But I will say this. There are some things about waiting that I know. I don’t live in the moment as much as I would like to, and am often thinking of the next thing to come. I’ve thought sometimes I have been always waiting for life to begin. At age 38, I realize this is no way to live — I need to jump in. There is the common affliction of waiting for time to do something. Ideas come and go and I think “one day I’ll write that down.” But as so often happens, amid the busyness of relationships, family, work and the rest of life, that time seldom comes. I also often wait for opportunity. I’ve been fortunate that sometimes opportunity presents itself. But when it comes to writing, one mustn’t wait, one must do. Whether there are opportunities to “publish,” “be read,” “do something with it,” or not, one must write. As it turns out, I conceived the idea for this blog shortly before I learned I was expecting a baby, so the “waiting for merlot” part ended up being real! 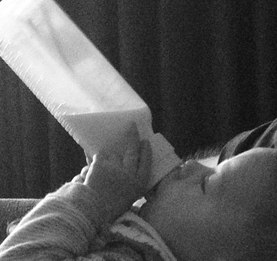 (And since I’m nursing him, it might be quite awhile before I get to have wine again!). Being a new mother compounds the above challenges. But it also makes my mind active, while I wait for my son to fall asleep or lie awake at night waiting for his cry. There are ever more things to contemplate and stew together in my head. I finally also have a reason to write that is outside me. My boy may never read these posts — or want to — but I want, for him, to be a person who does something. And so, I have launched this blog.